I'm just back from a week on retreat at the Rivendell Retreat Centre. It was very good to get away and experience life on retreat again. There were several stand out features of this retreat. It began with an all comers weekend looking at the Bodhisattva White Tara. Monday to Friday was an order retreat with only four of us staying on. We immediately plunged into a more intensive program of meditation, reflection and puja - immersing ourselves in the visualisation practice that we all share. The four of us were relative strangers, two of the others were friends already, but I had not met the others, and neither had the fourth person. We were a mixed bunch: 3 men, 1 woman; 1 married with a family, one living with a partner, one living in a Buddhist community and celibate, one lodging but in a long term relationship; 1 homosexual, 3 heterosexual; 1 ordained 10 years, 3 ordained 2 years or less; two with tattoos, and 2 without. The week was extremely harmonious, and every one contributed both domestically and ritually. I was doing 3 hour-long sits, plus a long puja in the evening, as well as a lot of calligraphy, the others were doing more sitting. We were in silence from evening until lunch every day, and mostly doing our own thing when not meeting for meals or collective practice. It all just flowed naturally as though we had all known each other for many years. I don't think that under other circumstances we would have come together at all, let alone in the way that we did. Every morning we chanted the Three Refuges and the ten precepts, and after a day or two it seemed to me that this was the root of everything. That we, a disparate bunch of strangers, could come together in the way we did was due to our common, explicit commitment to the Three Jewels. Not only did we give voice to that commitment in Pali evey morning, we spent our days making that commitment manifest and effective. And it was delightful. It was my first experience of the Western Buddhist Order in this way - as I'm just over one year old in the order. If we are all sincerely Going for Refuge to the Three Jewels, then we can have a rapport which goes beyond the incidental circumstances of our lives, beyond any superficial differences. Of course we were all devotees of White Tara and this helped. The visualisation practices associated with White Tara are especially beautiful. Some of our pujas included the sadhana visualisations and created a real sense of being in Tara's realm. Over the shrine was a large White Tara Thangka and at times it did seem to shine with a kind of inner light. White Tara is, of course, white in colour. Her main characteristics are that she sits in the Vajrasana (or Diamond posture) which I associate with repose, stability, imperturbality. Her right hand is stretched out in the mudra of supreme giving, and Tara gives what you most need. Her left hand is held to her heart, lightly grasping a spray of blue night lotuses: the mudra is fearlessness and one of the special attributes of Tara is that she saves us from fear. In each palm, in the soles of her feet, and in the centre of her forehead are eyes so that she has 7 in all. The eyes represent Tara's wisdom which sees things as they really are. Sometimes they are said to enable Tara to see what needs to be given where. Also associated with wisdom are the five gems that she wears in a tiara in her hair - the five wisdoms of the Buddhas are her decoration. Finally above her head, or sometimes actually tucked into her headress, is Amitayus (Infinite Life) who is a reflex of the Buddha Amitabha (Infinite Light) the red Buddha of the western quarter who represents compassion. The symbolism is very rich! 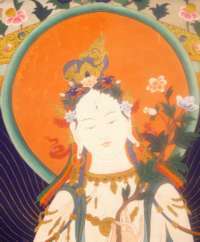 As with all Bodhisattvas, White Tara's body is made of light, and she appears in the clear blue sky of Shunyata seated on white lotus. All in all it was a very positive week, which I certainly needed. A year on from ordination I received a very strong confirmation that despite any difficulties I may encounter, that I am on the right path, and in the right Order, and even in the right country (for now). I felt a lot of gratitude to Sangharakshita, Sona, Nagabodhi and my other spiritual friends and teachers; and to my protectress, Tara.